Experience a whole new way to pay when you add your Westside State Bank debit card to Apple Pay. Using your compatible Apple® device, make purchases in stores, online and in apps more securely than ever. Get the security and ease of Apple Pay while still enjoying the benefits and protections your debit card provides. It's easy to set up. The Apple Pay app is available on your iPhone®, iPad®, Apple Watch® and Mac®. All you need to do is connect it to a payment source, such as your WSB debit card. Just open the Wallet app on your iPhone, then swipe down and tap the plus sign. From there, you can use your device's camera to enter the card information automatically or you can type it in manually. It's simple to use. 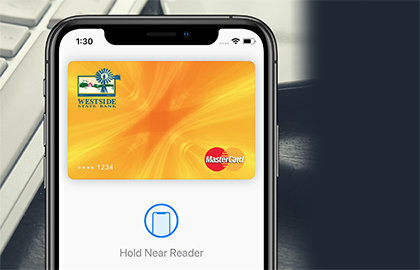 Once you've added your debit card to Apple Pay, you'll be able to make your purchase by holding your compatible Apple device near a contactless reader at a participating retailer. Complete the transaction by placing your finger on Touch ID® when prompted. It's smart and secure. Apple Pay doesn't share your card number or identity with the merchant. Breathe easier knowing that your actual debit card number isn't stored on your device or on Apple servers either. It's versatile. Apple Pay lets you make purchases at participating stores, online retailers, and within apps. Use it at restaurants, taxis, vending machines, and more -- in fact, now even a person-to-person payment option is available! Have questions? Check out the Apple website for FAQ's, resources and more. Need any help? Contact us.